At the Toei Eiga-Mura, Kyoto’s famous movie theme park, one of the main attractions combines acting, stunt work and projection mapping to create a popular Ninja themed action show. The name of the show, Jiraya, refers to a popular folk hero with the ability to use magical formulas in order to reach his goals. Thirty minutes seem a long time for only four characters to fill, but the actors manage to brilliantly combine charisma, humour and many visual references to both popular anime culture and ancient traditions. Eiga Mura (literally "movie village") is both a working film and TV studio, as well as a tourist attraction. Countless famous Japanese period dramas were and are still being shot here. The setting is comparable to western towns in American film studios, since it can easily be adapted to new projects by changing the different house and shop fronts very slightly. 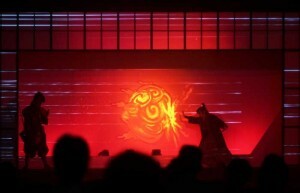 The Jiraya show is one of the most popular attractions at the Kyoto Eiga Mura. Visitors can enjoy the performance three times daily. 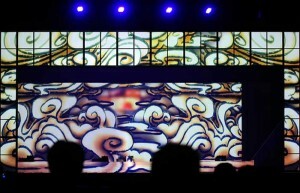 A shoji-screen style border frames the stage on three sides, which has a white projection screen as its main background. Ambient content sets the mood for the different scenes of the adventure narrative. Due to the actors’ precision when it comes to hitting their marks on stage, it becomes possible for them to seemingly interact with some the projections behind them. In one scene, the red outlines of mystical Ninja appear, in another, one of the heroes shoots energy balls at his opponent. Viewed from the audience’s perspective, the effect is very entertaining indeed. Two softedged EPSON EB-Z10005 projectors at the back of the theatre and a coolux Pandoras Box system is all that is needed to make the exciting story come alive and turn it into true family entertainment. 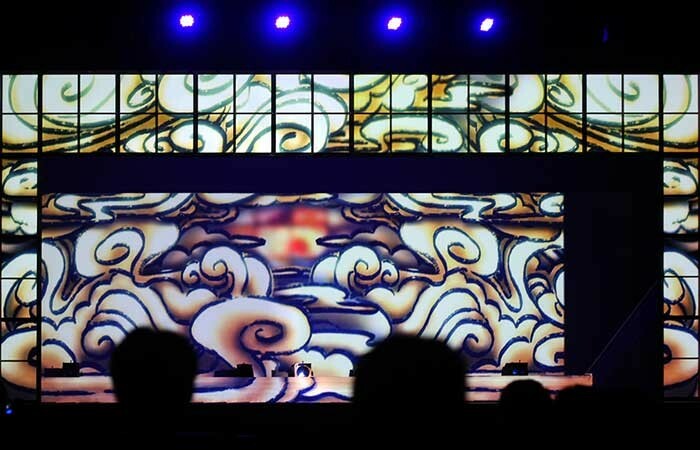 Both the content and the technical implementation were realised by the Japanese event and projection mapping specialist Takenaka. Old legends, modern technology and classical stage craft have been combined in an aesthetically beautiful show that will make adults think of their childhood heroes and will also resonate with children used to a steady diet of modern Dragon Ball style animation series.